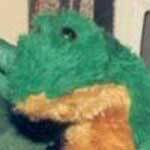 There is so much to say about a stuffed animal; they are warm, cozy, best friends and put a smile on our face. A child's room wouldn't be complete without stuffed animals on the bed to hold on to during the dark night and play with in the light of day. 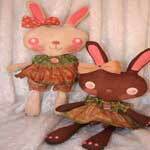 Here you will find a large array of free stuffed animal patterns separated into categories. 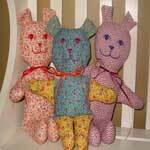 Choose from teddy bears, bunny rabbits and more. Say “oui oui” to making this adorable bear from France; just follow the instructions. 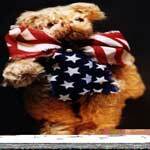 Here is a project for an adorable patriotic bear with a big bow of stars and stripes around his neck. 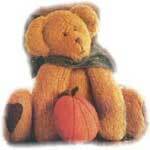 This honey colored teddy bear is sitting pretty and holding a pumpkin just in time for fall weather. 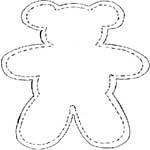 Make a sweet mini teddy bear using this template, plus simple instructions. Get started on making a bear doll that any child would love cuddling with when going night, night. 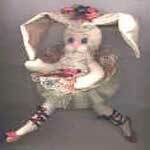 Make a ballerina bunny with movable limbs. She is also dressed from head to toe in ballerina attire. 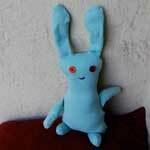 Recycle an old t-shirt by using this simple sewing pattern for a cute bunny buddy for you or someone special. 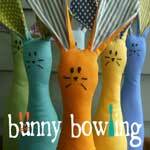 Bowling pins never look so cute as these little bunny bowling pins with long ears and sweet faces. 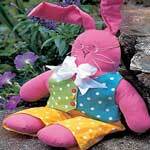 Little girls will love playing house with this precious bunny doll who resembles raggedy ann. 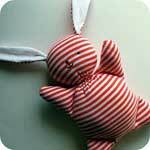 This rabbit would be a wonderful baby shower gift as this charming rabbit is small and so very soft. Easy rabbit pattern for a bunny all dressed up in a vest with matching slacks and a bow tie. 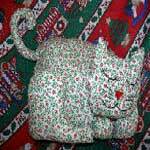 You can use the suggested fabrics or get out your scraps and make this precious long legged cat. Angel pattern for a sweet a fluffy kitty angel with a grapevine wreath halo and a felt heart. Here is a cat all curled up for a cat nap. Great pillow for Christmas or use a different printed fabric for anytime. 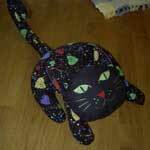 This cool cat works great as a door stopper as he is filled with dried beans for weight. 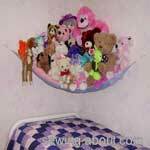 Give all your stuffed animals a place to hang out in this cute little corner hammock you made using this design. 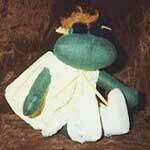 Make this adorable lady frog all dressed up in shoes, a dress and of course sunglasses. Great for a nursery or child's room, this giraffe stands on its own four long legs and has big doll eyes. Here are five dragon projects to pick from, each with their own cute face and character. You won't want to eat this stuffed bird but you will be happy to make one. This is the cutest little mouse that has a button for a belly button. The sock monkey can be a child's favorite stuffed toy. It's so easy to make too. This little angel kitty has a sweet red heart that she wears on her chest. Here is Mr. Cat and he has extremely long legs and a smile on his face. 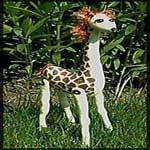 Make this beautiful Germaine Giraffe for someone special. This project requires either sewing or hot glue skills and is lots of fun. 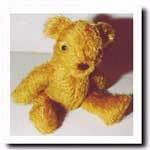 Make this precious miniature angel bear for someone special.